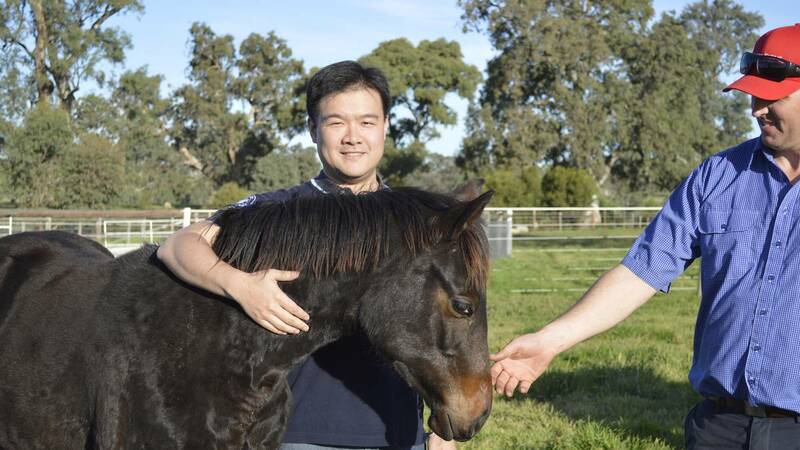 YEARLING: Goldin Farms’ Stud Manager Andrew Perryman (right) and Mr Fang with a colt by Nom de Jour from Recollection. Thoroughbred stud Goldin Farms, at Lindsay Park, Angaston will be returned to its former glory which made it world-famous and prompted a visit by the Queen. Sean Fang, Vice President of Goldin Group, said the stud’s new owner Mr Pan Sutong was keen to restore the stud to its former profile. “Mr Pan shares the passions of the Barossa residents, he has the utmost respect for history, heritage and nature,” Mr Fang said. On a two-day visit to Goldin Farms, Mr Fang said no expense would be spared to rejuvenate the former Lindsay Park Stud. Mr Fang went on to explain how Mr Pan purchased the property and stressed it was a private, not commercial, investment. Mr Fang said they had been aware of Lindsay Park Stud being for sale but when they made enquiries were told it had already been sold. Mr Fang said there was no decision on when Akeed Mofeed would arrive at Goldin Farms but in the interim the stud was buying mares to ensure a band was ready when he does arrive. South Australian Andrew Perryman, who has experience working with the world-famous Darley Woodlands Stud in New South Wales, is Goldin Farms’ Stud Manager, and one of his jobs is to source mares for the venture. Earlier this month he purchased eight mares at the 2014 Inglis Australian Broodmare and Weanling Sale in Sydney. Mr Pan also purchased a yearling colt at the Sydney Inglis Easter Yearling Sale to race in Australia. Mr Perryman said neighbour Tony McEvoy at Kildalton Park was training the yearling along with an import called Martian, a winner of the 1986 metre maiden at Goodwood in the United Kingdom in September last year. Goldin Farms also owns two racing fillies, one currently trained by Liam Birchley and the other by Brett Cavanough.